Johann Wolfgang von Goethe (b. 28 Tebaxe 1749 Frankfurt, İmperatoriya Romaya Cermeni - m. 22 Adar 1832 Weimar, Almanya) yew nuştekaro Alman biyo. 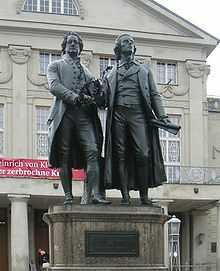 Works by Johann Wolfgang von Goethe at Project Gutenberg List and links to 61 works. Ena perre roca 23 Adare 2017 de, saete 07:58 de vırriye.